I got into the restaurant industry because I love to cook. Becoming a chef and working in a kitchen was the best way for me to indulge my greatest passion. My formal training started when I was 14 years old, when I got my first job cooking and then fast forward to my first executive chef position at Gasthaus zum Gupf in the Swiss Alps. But, it was my mother who inspired me to take this job. She was a tremendously talented cook, with a special gift for picking the best produce at the market. I was always amazed by her astonishing ability to choose the best tomato or the most perfect peach. My experiences with her at the market and then back home in the kitchen, where we would carefully clean and cook our produce, ignited my dream to be a chef. The strongest, most important partnership behind Eleven Madison Park and The NoMad has been the one between Will Guidara and me. We’ve harnessed the power of this partnership to transform Eleven Madison Park, starting in 2006. When we purchased the restaurant together in 2011, we were able to fully unleash our creativity and discover what happens when we work together. Because of our early experiences together, collaboration is the very ethos of our company. The way we understand it, running our restaurants is like playing music. Only by listening and responding to the people around us can we find just the right rhythm and melody. This is why we collaborate with our staff, as much as we do with one another. After all, they’re the ones who really make the music happen. What are the most popular dishes at Eleven Madison Park and which are your personal favorites? Because using fresh, local ingredients is so important to us, our menu is very specific to the seasons. When the seasons change, so does our menu, which makes it hard for one particular dish to take dominance. That said, the roasted duck is a guest favorite that we simply can’t take off the menu. It’s very easy to answer this question: We are successful because of our team. Whether they are on the floor of the restaurant or behind the scenes, our staff genuinely wants each guest who comes to eat or drink with us to have an experience that will make them want to return. Finding great talent is difficult in our industry, and we’re incredibly lucky to work the people who make Eleven Madison Park and The NoMad possible. Design and architecture are key elements of the dining experience. Whether it’s formica table at a diner, or a supple, leather banquet at a place like Eleven Madison Park, a restaurants décor must speak the food being served. While the food itself may taste the same regardless of where you eat it, the experience will be greatly altered. At Eleven Madison Park and at The NoMad, we want to do more than just serve food: We want to create an experience that engages our guests on many levels. What they see, hear, and touch when they are in our restaurants is a huge part of this. At Eleven Madison Park our vision is to create an experience that is distinctly and sigularly New York. A room that speaks to this specific sense of place is essential. Our dining room, with its art deco design, terrazzo floors, and sky-high window with views of Madison Square Park could not be more perfectly inline with what we are looking to achieve and share with our guests. Location is very important, especially in a city like New York where competition is so intense and operating costs are so high. A great location can keep a restaurant around for a long time. But some restaurants can thrive anywhere, acting as destination in and of themselves– but that’s always a more difficult challenge. In New York specifically, neighborhoods also have an unprecedented way of changing, seemingly overnight. A restaurant that might be in a less than desirable location one minute, might be at the center of it all the next. Take the NoMad neighborhood as an example. It’s an area of New York that has been completely revitalized. Just a few years ago, it was a gamble to open a business in this part of the city and now, it’s an incredibly desirable place to be. My mother is the most inspirational person in my life. Spending time with her at farmer’s markets, working in our home kitchen to prep and cook meals, and seeing how much care and attention she put into even the simplest family meals taught me such valuable lessons. Those lessons have stuck with me all my life. They provided a great foundation for me once I moved into a professional kitchen as a teenager. When I worked for Chef Gérard Rabaey, I learned even more about the importance of perfect ingredients, of precision in the kitchen, as well as discipline. Cooking under him shaped who I am as a cook, but it was because of my mother I was inspired to follow this path. The best thing you can do is come in, relax, and just let our staff guide you through your meal. Nothing makes us happier than to provide an experience that brings the rich and magical concept of hospitality to life. I’ve just returned from Provence. I’ve traveled there many times and always leave knowing I’ll be back. When I’m there, I feel relaxed and inspired. There is always time to savor and appreciate what is beautiful and what is delicious. And the best things there are the most simple – a bottle of red table wine, a dish of olives, and a view of a lavender field. What more could a person need? 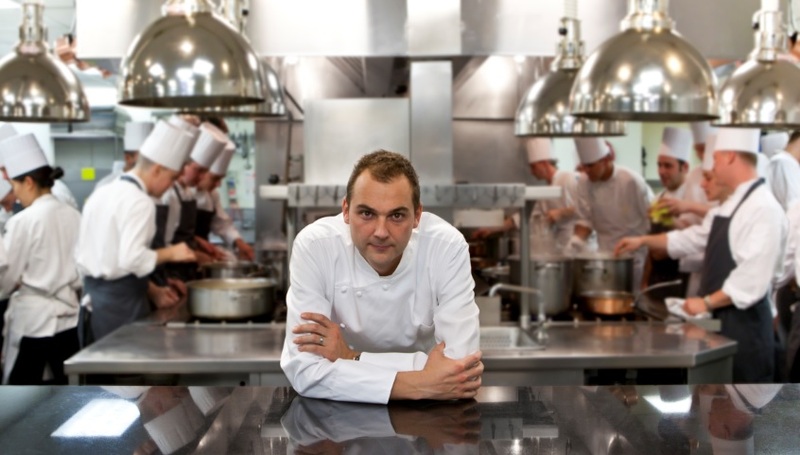 What’s next for the Eleven Madison Park? Right now we’re looking to the fall menu. Each menu is very involved and requires so much effort and teamwork. Countless hours are spent conceptualizing and then perfecting each dish. I am very excited to share it with our guests!